With the Callaway Kickback Cup Gift Set poor weather can't be your excuse to not practice your putting. This great training aid will automatically return your putt up to 12 feet away. Battery operated, for added convenience, so you don't have to track down a wall outlet or limit where you fine tune your putting. Extremely compact so it's easy to store and transport. Use in conjunction with your favorite putting mat for a range-like experience at home. Includes two Callaway golf balls. 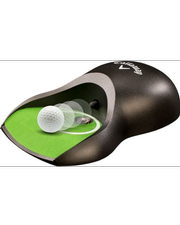 If you have any more questions about the Callaway Golf Kickback Putt Cup Gift Set (Battery Operated and 2 Golf Balls); do not see the model you are looking for; need custom options; or prefer to not purchase online, then please call us at (630) 656-1291.